In the Mexican era, whole cattle hides were California's principal export. To prevent theft law enforcement sometimes checked the brands on hides before they were exported by sailing ship. Most went to the Boston-area shoe industry. The hides would stay intact during export and tanning, then be cut up at a shoe factory to be reused in the higher-value product. 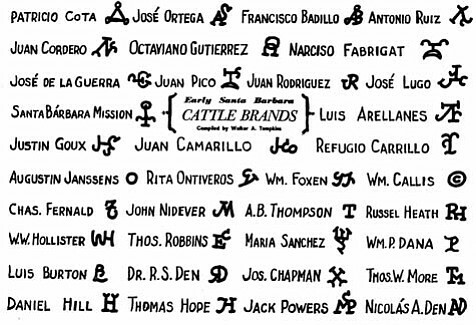 I figure that many, many copies of California cattle brands reached the hands of the Boston shoemakers. The brand symbols are reasonably well documented in California records, but did anyone in Boston know or care which symbol was which? Was the branded part of the leather clipped and scrapped, or just incorporated into a discreet part of the shoes? Browse other questions tagged 19th-century california animals symbols boston or ask your own question. What are the origins of coursing with cheetahs? What is the Balboa Park in San Francisco named after? What did the administrators of secularized California missions do? What was the first school in Santa Cruz, California? When did mature redwood trees become possible to harvest? What did Dr. Peter Smith do with his windfall? When did Aurochs (large wild cattle) become extinct in Britain? What is the history of the “surrender” gesture?